Sketching in the Office — A New Creative Trend? Over the past few years, we’ve seen sketching grow from being the hot “new” method to just another skill we use to get the work done. Which means that sketching, and more importantly learning to sketch, is a rite that a lot of us now share. The idea is similar to doodling to get the imaginative juices flowing, or even writing maniacally on a chalk board during a brain storming session. Interestingly, we have recently seen the concept of the sketch used in communications and sociology for life writing and memoir/memory writing purposes. 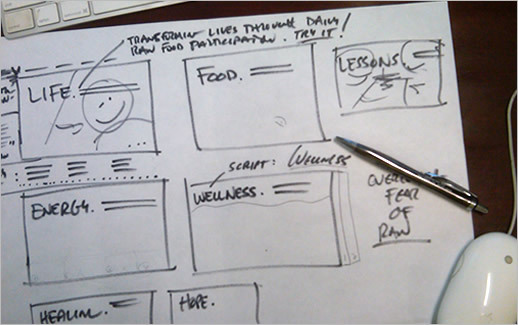 Developed by Dr. Carol Rambo, the method is derived from pencil sketching—you sketch out small narratives from your past, using events or people, and then use these fragmented texts to create a whole memory. After all, no one has a perfect memory. Start working with people who sketch, or seek out your sketchiest friends, and pay attention to what they do. Give in to your envy, for it will motivate you, but also be observant. Watch other people’s techniques, and copy what you like. Discover the vital importance of line weight in calling attention to the things that matter. Learn how cross hatching and lined backgrounds can be used to add shadow, depth, and a sense of contrast to sketches. Notice how meditative the process of stippling is and how graphic the effect, but realize in the end that it’s very time consuming, and vow to use it only on special occasions. Discover that when you draw quickly, without intention, it is sloppy and awkward. Draw basic shapes. Slowly. Notice that boxes come easier when you take a deep breath and prepare yourself mentally for straight lines and right angles. Realize that even something as simple as four straight lines requires a measure of focus. Sign up for a drawing class. Invest in the tools. Good tools will make you eager to play. Attend class and pay attention when the teacher tells you to use your shoulder and hold your wrist straight. They are the keys to finding your own line quality, and line quality is the unique signature of every sketcher. Finish out the semester if you can, but don’t beat yourself up about it if life intervenes. Learn that sketching doesn’t just happen in a semester anyway. It’s a lifelong practice. Read anything you can find about comics, storyboarding, and how to draw quickly. Create a little library full of books like these. If you can, get your hands on a slim little volume called Cartooning Philosophy and Practice by the excellent, disturbed cartoonist Ivan Brunetti. Do the exercises. Draw a car in five minutes. Then in one minute. Then in thirty seconds. Then in five seconds. Realize that good sketching is visceral, and that visceral sketches come not from painstaking verisimilitude, but mortal intuition. Look around and notice that everywhere you go, you see sketching. Everywhere! In the title credits of movies. In ads on busses. In presentations at conferences (maybe even your own). Realize that you might be caught in the upsweep of a sketching fad. Welcome it, and feel appreciative for whatever brought this friend to your door. Speculate to whomever will listen that sketching is important in our lives right now because widespread technology adoption is putting a digital layer between us and our creative tools. Reaffirm to yourself your innate creative potential as a human being and see your own connection to sketchers throughout history — from Leonardo da Vinci to the cave painters of Lascaux to Charles Schultz. Explore, if you are inclined, how much drawing with a pen makes you want to write with a pen. Start keeping a notebook to jot down your thoughts and see, to your surprise, that your ideas come out differently when they’re written by hand. Slower. More deliberate. More reflective. Admit that, sure, technology is a great liberating force. But plant your feet and squint your eyes and declare that, even so, you’ll be damned if you ever let it disconnect you from your own precious, contemplative human solitude. Sounds like a good plan, eh? This is your call to action today — get out that pencil/pen and blank sheet of paper and start sketching and see where it takes you in solving any present problems, at the office, home, in your life, locally and globally. For great pencils. Checkout the Palamino pencil (Great for Sketching and Artists) available at www.pencils.com.